The York x400 cross trainer marks York’s entry into the high spec front wheel drive cross trainer market. 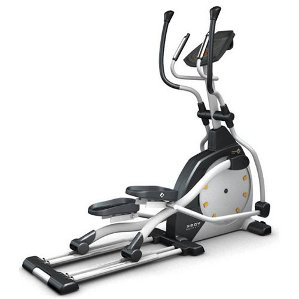 The X400 cross trainer is part of their Diamond series elliptical trainers in the York range and really delivers in terms of features, build quality and performance. The first thing your reviewer noticed was the distance off the ground when using this machine. This is definitely the elliptical cross trainer equivalent of a 4×4 car! While it feels like a great position, you should watch that you’ve got enough ceiling clearance for any tall users! We used a tape measure to check and at the highest point of the stride, the foot pedal is 50cm from the floor level. To check ceiling clearance, add half a meter to the height of the tallest potential user of the machine. The X400 is a substantial machine weighing in at a whopping 85kg! Thanks for the combination of heavyweight components used and the double rollers on each leg, the X400 cross trainer has one of the smoothest stride actions that we’ve tested. It really does feel both assured and silky smooth! The stride length is a nice and long 20″ (50 cm) and is suitable for even the tallest of exercisers. One of the many nice touches on this cross trainer is the buttons on the top of the swinging handlebars. These 4 buttons allow most of the functions on the computer to be controlled without needing to stop the upper body part of the exercise to fiddle around with the console. Another nice feature is the the two position adjustment on the large footplates. By tilting forwards by a few degress, this helps to maximise the time the whole of the foot is support of by the footplated over the course of a full stride, thereby reducing strain on the joints.The console has a large multi coloured LCD screen that is logically layed out. Our only criticism would be that part of the display doesn’t have the best contrast ratio when viewed by users shorter than 5′ 11″ in a brightly lit room. It would have been nice to have seen the console tilt-adjustment feature of the X302 (York’s top of the range rare drive elliptical trainer). There are plenty of programmes on the X400. To get the very best of out of the programmes, you need to use a chest belt which is available as an optional extra. There is a manual programme as well as 6 pre-set programmes, a body fat profile programme, 4 heart rate contol and 4 user defined programmes. The programmes are simple to use and very effective. The reason for the 4 separate heart rate control programmes is that the first enables setting a precise target heart rate and each of the remaining 3 target 65%, 75% and 85% of maximum heart rate. The 65% programme is most suitable for burning fat (exercising for longer durations), 75% to improve general fitness levels and 85% for a solid cariovascular workout. To start a heart rate controlled programme, you simply enter either the desired duration or distance to be covered, the desired carolie burn during the workout and age in years and hit start! The programme continues with the resistance increasing if the heart rate (ideally measured from the optional chest strap) is below target level and reducing if above target. If the resistance becomes too hard and you preference is to increase the speed, you can simply over ride the resistance using either the console buttons or the handy resistance control button on the top of the right handlebar. The programme continues until the specificed distance or time is covered, or alternatively when the calorie target for the session is hit (whichever comes first). At the end of a session, the user can hit the ‘recovery’ button on the console and the computer measures the rate at which the heart rate reduces back towards resting levels. This is used to calculate a fitness rating of 1 to 6 (lower the number the better). This feature is a great way of monitoring fitness levels improving over time. The body fat programme is also an interesting programme. The user enters their gender, height, weight, age before starting the programme. Once started the pulse sensors need to be grabbed for a few seconds whilst the computer measures the percentage body fat. Based a combination of the measured body fat percentage and all of the other data, the computer classifies the user as one of 9 body shapes and runs a 30 minute programme that is professionally designed for the particular body type! The York X400 is not currently available from any retailers we're aware of in the UK. 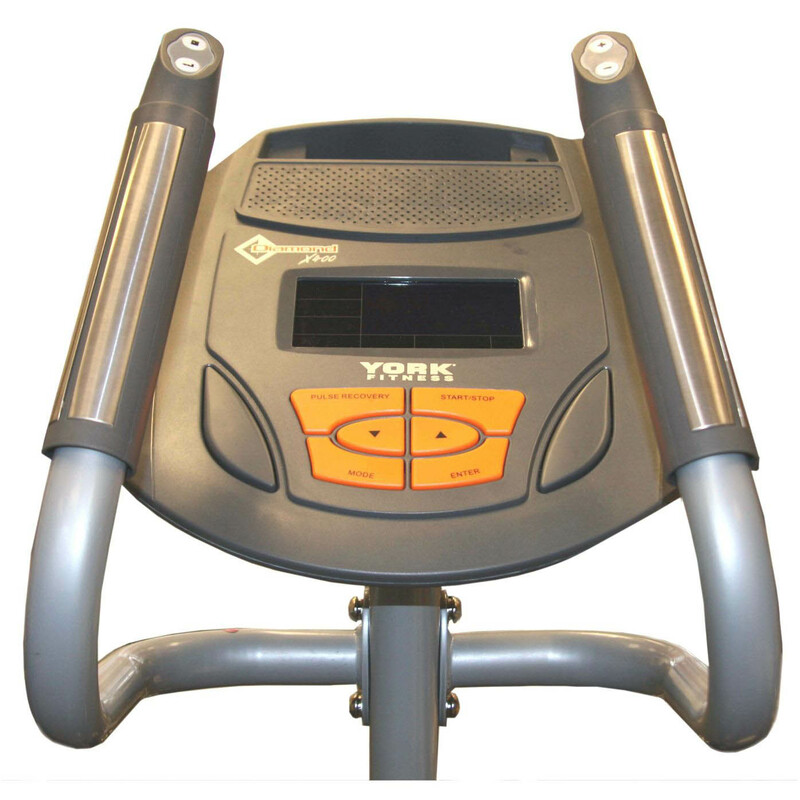 For those that have the space, the York X400 cross trainer is a very good choice. It is a high specification machine with features normally seen on machines at much higher price points. An example of this is the dual track aluminium rails and the pitch adjustable footplates. The warranty is a 2 year onsite warranty (as long as machine is registered). The console has a large multi coloured LCD screen that is logically layed out. Our only criticism would be that part of the display doesn't have the best contrast ratio when viewed by users shorter than 5' 11" in a brightly lit room. It would have been nice to have seen the console tilt-adjustment feature of the X302 (York's top of the range rare drive elliptical trainer).